The Global Report on Internal Displacement (GRID) is the authoritative source of data and analysis on the risk, scale and impacts of internal displacement worldwide. The report offers insights into key challenges and opportunities in addressing and preventing displacement. It also highlights areas that require increased investment at local, national and global levels. GRID 2019 focuses on urban internal displacement and presents new evidence on the humanitarian and development challenges presented by displacement to, within and from towns and cities. 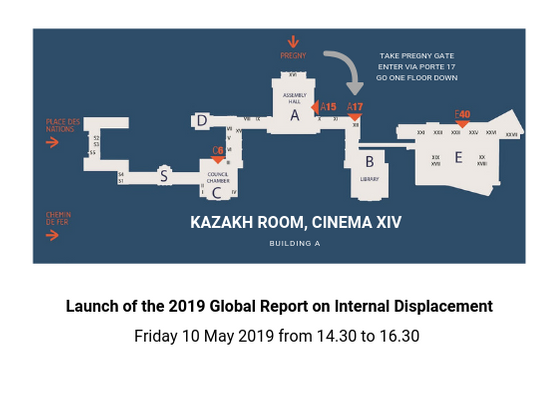 At the launch we will discuss the key findings of the report with representatives from municipal authorities in Iraq and Japan, the United Nations and civil society, all of whom deal with the issue of urban displacement every day. Simultaneous interpretation from and into English and Arabic will be provided. The event will be followed by a reception at the Delegates Restaurant, Palais des Nations. RSVP by emailing comms@idmc.ch no later than 3 May 2019. If you do not have a UN badge to access the Palais des Nations, please register with INDICO here. For directions to the Kazakh Room (Cinema XIV), click here.